An Asterisk PBX IAX client. Is there a better alternative to LoudHush? Is LoudHush really the best app in Network category? Will LoudHush work good on macOS 10.13.4? LoudHush is a softphone application. It functions as an IAX client for the Asterisk PBX. 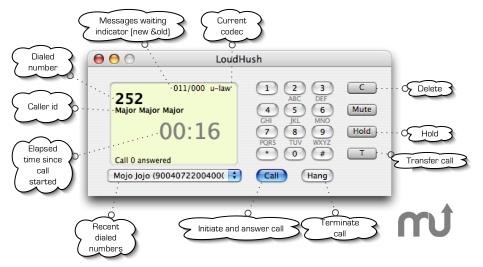 With LoudHush you can initiate and answer, hold and transfer voice calls using your computer. LoudHush is written in Cocoa/Objective-C and integrates nicely within the OS X environment. LoudHush is distributed as shareware software. If you run it without a license, it will quit five minutes after being launched. This release fixes a number of bugs in AppleScript notification of incoming calls, volume management, and using the hash key with the Spanish-ISO input method. Mac OS X 10.3.9 or later, An Asterisk account, speakers and microphone. LoudHush needs a review. Be the first to review this app and get the discussion started! LoudHush needs a rating. Be the first to rate this app and get the discussion started!